The Eastern Front in the Great War is something few are aware of; the Eastern Front of a generation later in Hitler’s war has eclipsed it and the fact that at any given time more than a million German soldiers faced potentially millions of Russian troops, both deadlocked in the East in the same way there was deadlock in the West. The Eastern Front became a mirror of France and Flanders in some ways; trenches, No Man’s Land, barbed wire, shelling and attrition. Joined by troops of the Austro-Hungarian Empire more than 800,000 Germans died in the East along with 1.15 million Austro-Hungarians; opposite them more than 2.2 million Russians died before the Russian Revolution changed everything. This photograph comes from a collection of a young German gunner who served on the Eastern Front between 1914 and 1917, before he moved to France where he died in 1918. Here two German war horses are pulling a transport wagon used to carry material, food and other equipment for the artillery regiment he served with. In both World Wars horses were the only reliable transport in the often awful conditions on the Eastern Front: extremities of cold and rain which turned the roads and battlefield into a quagmire, and often caused more casualties from the elements than the enemy. Thousands of horses died on the Eastern Front, forgotten animals on a forgotten front. Gas was a weapon that will be forever associated with the Great War. First used at Ypres in April 1915, it caused many casualties among the front line troops. But gas did not just linger on the battlefield – it drifted. And in drifting it moved into areas that were used to bring up supplies and ammunition, and as the war progressed, these areas became often as much targeted as the front line. As the majority of transport in every army during WW1 was horse or mule transport, then these animals became as much affected by the gas as their human masters. 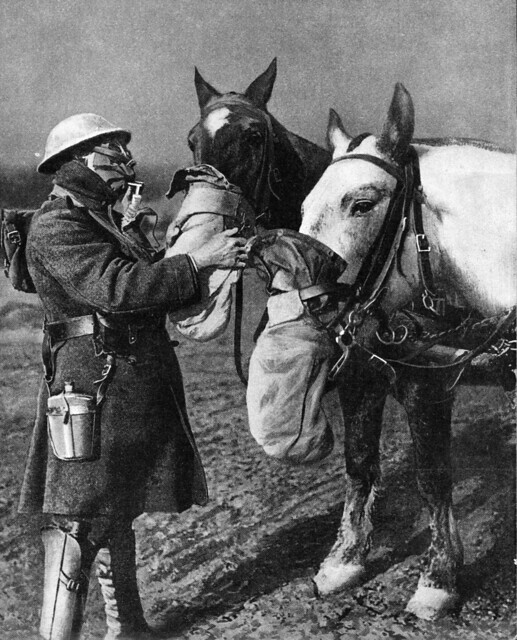 Just as gas masks were developed for the troops, masks were equally introduced for horses; this image shows a British soldier wearing a Small Box Respirator, introduced in 1916, checking the gas masks of two horses pulling a service wagon. Gas warfare was a bad enough experience for humans; one can only wonder at the experience the horses went through when poison gas enveloped the battlefield. The use of horses and horse transport by the Chinese Labour Corps is not something widely considered but this image shows two types of such transport in use in 1919. On the left is an Army Service Corps Water Cart and on the right a General Service Wagon. In both cases the driver of the vehicle is from the Army Service Corps but they both have CLC in the cab with them. One can only speculate on the circumstances of this photograph but it was taken in 1919 and in the rear background is a road sign which points to the village of Roisel. Roisel is on the Somme and was the scene of fighting in August 1918. At the time this image was taken the CLC were being employed in this area to bury the dead and clear the area of unexploded ordnance. It is therefore likely that these War Horses and their masters were being employed in such work and were part of a team roving the Somme battlefields at this time. The subject of horses in the Great War has proved a popular subject on this site, no doubt fuelled by the huge success of the War Horse movie. This week on the Blog we move to Monday, Wednesday and Friday posts and this week all have a War Horse theme. This image shows personnel of an Army Veterinary Corps (AVC) unit in France in the early period of the war. 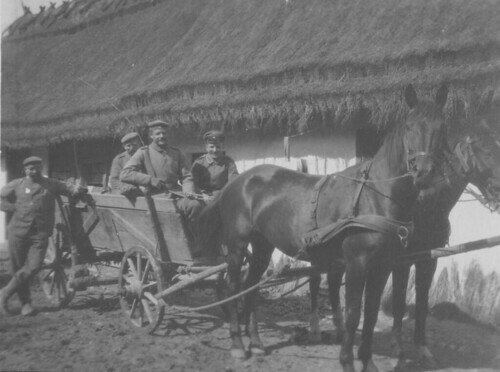 When the regular army of the British Expeditionary Force want to war in 1914 most of its transport – like most European Armies of the day – was horse drawn and an important part of its Order of Battle were AVC units like those seen here who treated the horses wounded and injured on active service, or those that had become ill during the winter of 1914/15. 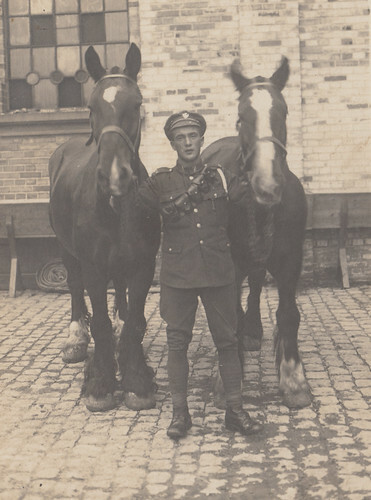 Horse care by the AVC was a hugely important job as the regular army operated on the premise of having a limited number of available horses and it was better to treat animals and return them to work rather than put them down; unless that was unavoidable. 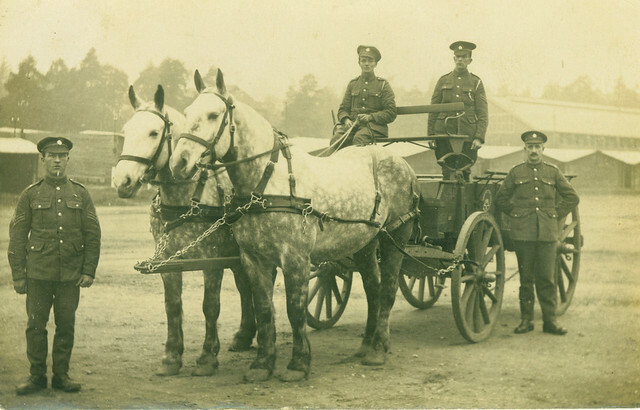 By 1918 there were dozens of AVC units operating on or just behind the front, treating thousands of horses and in many ways they are the unsung heroes of an army that even in the last year of the war with increased mechanisation still relied heavily on horse transport. The children’s author Michael Morpurgo published War Horse in 1982 long before the growth of interest in the Great War began. He has said many times that little did he realise it would morph from a child’s book to a play seen mainly by adults to now a Hollywood film. While some websites are arguing about whether the right uniforms and equipment will be shown, or whether it will be an exaggerated North American view of a war that it barely known of in the US, it seems likely it will bring many with only a passing interest in the subject to ask more, and perhaps remember a few stories of war horses passed down in their own family. Horses in the Great War are as much a symbol of that conflict as the mud of Passchedaele or the gas mask. Veterans I interviewed in the 1980s had harrowing, often terribly sad memories of animals they had cared for at the front, and in my Great War photo archive I have literally hundreds of images showing a beloved horse, special to a particular soldier who brought them home. 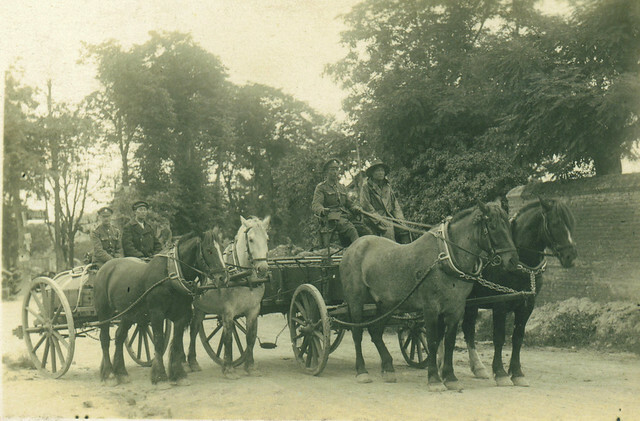 An Army Service Corps Horse Transport limber in France 1918. The sheer scale of animals used is incredible. The British Official History shows that in August 1914 the army had 165,000 horses on the establishment; doing everything from pulling wagons and ambulances, to serving in mounted regiments or serving as Sir John French’s charger. The same establishment four years later numbered more than 828,000 horses and in those four years millions of animals had been brought into use by the British alone. For the British effort horses were brought from a wide area; 428,00 from North America, 6,000 from South America and some were even sourced in Spain and Portugal. At war’s ending many were sold locally but nearly 95,000 were brought back to Britain for sale, sometimes to their original owners. 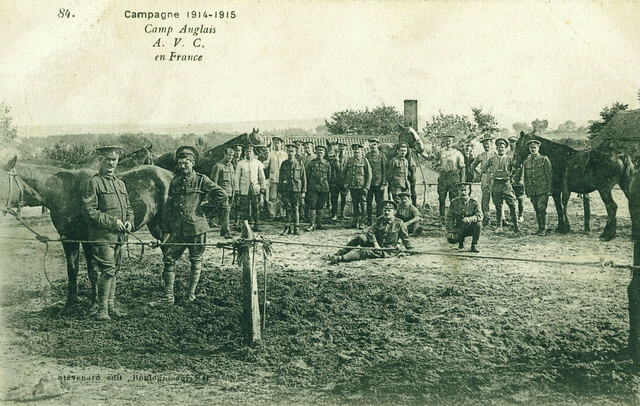 The cost to the horses was great; more than 225,000 of them died in British service on the Western Front and more than 376,000 died in service with the French Army; figures for the German war effort seem unavailable. 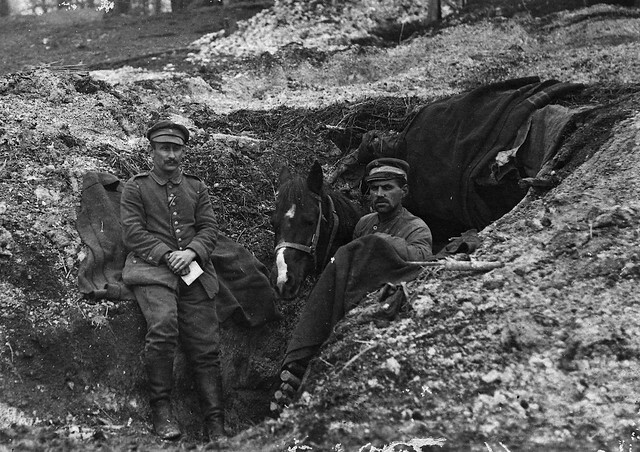 Germans shelter in a dugout with their horse, 1916. One of the sad facts when I lived on the Great War battlefields was that when a field was ploughed the most common bones found were not human but horse or mule. How these animals were loved can be expressed that many officers wanted to be buried with their horses if they fell; and I know of at least one war grave where that indeed happened. 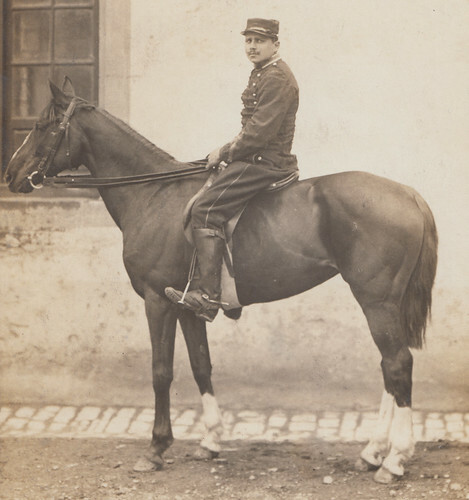 A French Poilu with his horse, 1915. War Horse the film will make thousands of people think about the Great War and remember the often forgotten sacrifice of those beautiful animals who marched under the thunder of the guns just like their human masters.